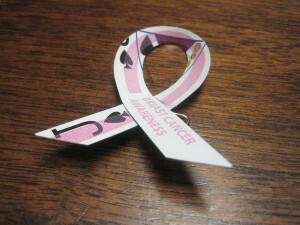 Caeser Resorts chose a very touching, and unique approach to demonstrate enterprise-wide solidarity towards Breast Cancer Awareness Month in October. Caesers Resorts contacted Ecologic Designs for a solution to create 8,000 upcycled lapel ribbons from their decommisioned casino playing cards. By using old cards, they helped avoid materials going into local landfills, and did not have to import or create new material for this wonderful project. Caesars’ employees have consistently played an important role in raising funds for cancer research by supporting the American Cancer Society’s Relay for Life, the Susan G. Komen Race for the Cure, the Making Strides Breast Cancer Walk, and other community events nationwide. Next time you are in a Caesers’ make sure to keep your eye out for them! 8000 Lapel Ribbons made from decommissioned playing cards. Sent to aproximately 40 Caesers Resorts in 13 States. Screen printed with “Breast Cancer Awareness”. they also pledged funding from their properties to the American Cancer Society.